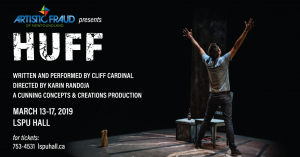 Huff is the wrenching, yet darkly comic tale of Wind and his brothers, caught in a torrent of solvent abuse and at high risk of suicide. Wind’s fantastic dream world bleeds into his haunting reality, as he’s preyed on by the Trickster through the hallways at school, the abandoned motel he loves more than home, and his own fragile psyche. Ancestral history combines with harsh reality and gas-induced hallucination in a tale of family, love, despair, and the possibility of redemption.